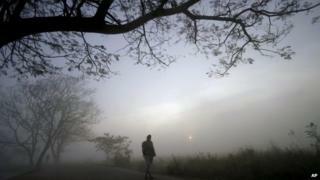 A dense fog has enveloped the capital, Delhi, and parts of northern India, causing massive travel chaos. The visibility at the Delhi airport runways dropped to below 50 metres at night and officials said 89 domestic and international flights were delayed or cancelled. Dozens of trains were also cancelled or delayed and road traffic on Sunday evening was crawling. Traffic disruption due to fog in winter has become routine in north India. Last month thick fog also descended on the capital, disrupting air and rail travel. But officials said the latest round of fog is the heaviest in three years. Reports from the Kashmir Valley and Ladakh say the region is seeing sub-zero temperatures with Srinagar city recording a minimum temperature of minus 4.2C. Cold weather is also continuing in most parts of the northern states of Punjab, Haryana, Uttar Pradesh, Madhya Pradesh and Rajasthan, the meteorological department says.